Deetken Impact invests in emerging economies to generate long term returns while making a positive social and environmental impact in communities. Deetken Impact Fund is a Canadian investment fund focused on fixed income investments in Latin America and the Caribbean. The Fund delivers strong financial returns through its debt and mezzanine investments in a diversified portfolio of mid-cap companies with missions to promote women’s economic empowerment, renewable energy, health care education and affordable housing. The Deetken Impact Bonds, which contribute to the Deetken Impact Fund, are structured as $5,000 bonds invested at a fixed interest rate of 6% over a 5 year term. The bonds are RRSP and TSFA eligible. NOTE: This offering is for 5-year Deetken Impact Bonds. Deetken Impact also offers an LP Unit investment in the Deetken Impact Fund. LP Units have a 5-year term and a target yield of 7 to 9% in U.S. dollars. Please click here to see that offering. Structure: This security is structured as 5 year bonds with a 6% interest rate p.a. that will contribute to the Deetken Impact Fund. The bonds will have the same risks as the LP units in the fund. Use of Proceeds: Deetken Impact Fund focuses on senior and subordinated debt investments in Latin America and the Caribbean. The fund invests in a diversified portfolio of high impact businesses that promote entrepreneurship, women’s economic empowerment, renewable energy and affordable housing. The fund delivers strong financial returns while also providing meaningful and measurable social and/or environmental benefits. Please note that this is not a complete investment summary. Investors should read all associated documentation including the offering memorandum and associated securities agreements before considering or making any investment. Launched in June 2016, Deetken Impact Fund (DIF) is a Canadian impact fund focused on senior and subordinated debt investments investments in Latin America and the Caribbean. 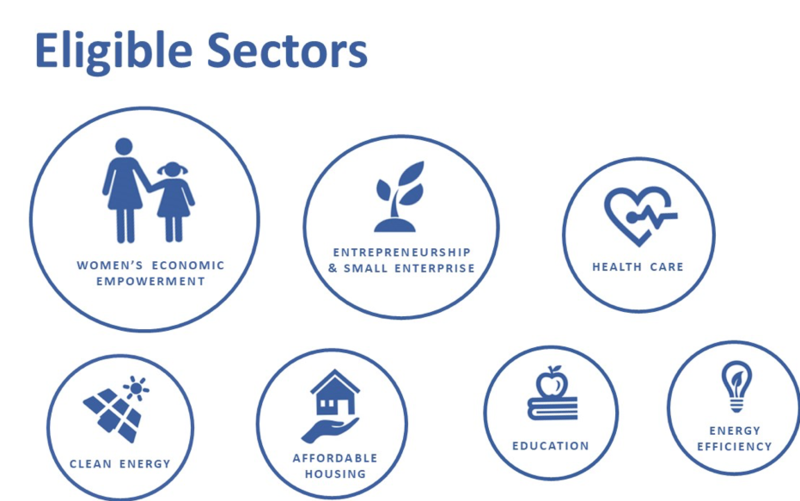 The Fund invests in a diversified portfolio of high impact businesses that promote entrepreneurship, women’s economic empowerment, healthcare, education, renewable energy and affordable housing. DIF currently has $20MM in assets under management, including a $4MM contribution from the management team. The fund is structured to allow for contributions from Canadian, US and international investors, as well as a choice for each investor to participate through either the Bonds or LP units. Impact Bonds. Investors receive a fixed rate return over a defined term of 5 years and have their investment qualify for RRSP and TFSA accounts. LP Units. Investors receive variable annual distributions with a target of 7 to 9% p.a. in U.S. dollars and do not qualify for RRSP and TFSA accounts. The Deekten Impact Fund aims to close 2019 with an investment portfolio of USD $30MM. The fund has a clearly outlined strategy to meet this objective. 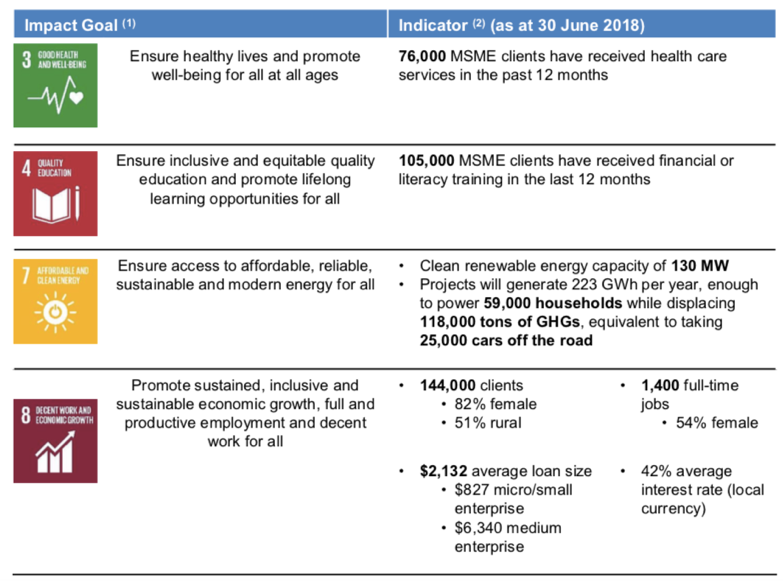 Maintaining the fund’s focus on the financial services and renewable energy sectors, using senior and subordinated debt complemented by no more than 10% equity. Increasing geographic diversification by entering the Caribbean region, and expanding its footprint in Central and South America including Colombia and Bolivia. The Deetken Impact Fund acts as a partner and steward for its portfolio companies, each of which has been carefully selected for its contribution to one of five impact goals. Portfolio companies are also offered customized business advice and technology transfer designed to foster sustainable and durable business growth. By helping to grow this group of impactful businesses, the Fund drives increased business activity such as lending to micro and small enterprise, installation of new renewable energy capacity or greater outreach of health care services for low income women. Deetken Impact supports the United Nations Sustainable Development Goals (SDGs). Specifically, investment opportunities and portfolio companies are evaluated based on their contribution to the following 5 SDGs: Good Health, Quality Education, Gender Equality, Clean Energy, and Decent Work & Economic Growth. 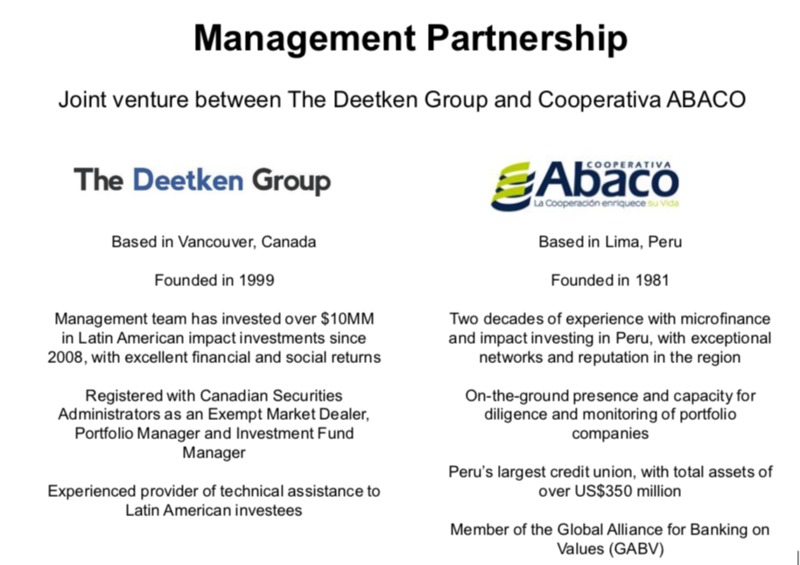 The Deetken Impact Fund (DIF) is managed by Deetken Impact, with offices in Vancouver, Canada, San Jose, Costa Rica and Lima, Peru. The Deetken Impact team brings significant asset management experience derived from their management of the Deetken Impact Pool (launched in 2008) as well as from past employment with some of Canada’s largest investment management institutions. In addition, each member of the Deetken Impact team brings specialist expertise in financial inclusion investments, with over 30 years of combined experience across emerging economies in Latin America and Africa. This experience has cemented in the Deetken Impact team a passion for investments that achieve both financial and social returns, as well as an understanding of the specific financial, operational and regulatory challenges faced by businesses which responsibly serve low income clients. Cooperativa Abaco joined Deetken Impact as a shareholder in 2015. ABACO is Peru’s largest credit union with extensive experience in lending to MSEs and Social Enterprises in Peru, and an extensive network of alliances in the Latin American region. The partnership creates the opportunity to leverage both local and foreign knowledge of investments in emerging markets and in Latin America. It also allows for on the ground diligence and monitoring of portfolio companies. The Fund will invest in countries classified as transition or developing countries. These countries can be subject to a number of risks including political risk, the risk of economic recession, the risk of high or rapidly changing inflation rates and the risk of diplomatic changes. Companies from developing markets are generally subject to standards of disclosure, auditing / financial reporting practices and requirements regarding the provision of information which are not comparable with those of developed markets. Foreign investments may be subject to restrictions and controls of varying degrees which can increase the cost of the investment, delay investments or impede repatriation of capital. The companies, institutions, organisations and vehicles in which the Fund invests are often experiencing rapid growth. These entities sometimes face challenges in recruiting and retaining qualified staff and management. These entities may also have a limited track record. The Investment Manager will seek to mitigate this risk as much as possible by investing primarily in regulated or supervised institutions, conducting thorough due diligence prior to investment and monitoring existing investments closely. The Fund invests almost exclusively in assets which are unlisted and not traded on a regulated market. The investments, and ultimately the Fund, are therefore relatively illiquid. The valuation of these illiquid, unlisted assets may vary substantially from the value actually realised at the exit of the investment. Loss of key personnel, especially with the Investment Manager, is an organizational risk. Loss of these personnel could have an adverse effect on the Fund’s ability to execute its investment strategy. The Fund will invest in securities denominated in U.S. dollars and this currency exposure will not be hedged against Canadian dollars. The Fund will invest in securities denominated in USD or in securities denominated in local currencies which are hedged into USD or CAD. The Fund may also take unhedged positions in local currencies where local currency appreciation is part of the investment thesis. José Lamyin is Chief Investment Officer of Deetken Impact and leads pipeline development and capital deployment. He received his BS in Engineering from the University of British Columbia and MBA from IESE School of Business (Barcelona). Prior to co-founding The Deetken Group, José had extensive experience as a business adviser for corporate clients throughout Canada, Europe and Latin America in mining, telecommunications, and finance. José has spearheaded much of the strategic growth of Deetken Impact since inception. To support the company vision to become a platform for impact investments, José has led the expansion of Deetken Impact into new impact sectors, including renewable energy, healthcare and affordable housing. Alexa is co-Founder and COO of Deetken Impact, which manages and distributes impact investment products to Canadian and global investors. Prior to joining Deetken, Alexa was an executive with African Alliance, a pan-African financial services group and an associate with the Canada Pension Plan Investment Board and the Macquarie Group in Toronto. Recently recognized as one of Vancouver’s Top Forty Under 40 by Business in Vancouver magazine, Alexa is a welcomed speaker on impact investing and champion of improving access to impacting investing alternatives for Canadian investors. Alexa is a CFA Charterholder, a Chartered Business Valuator and holds an MA in Financial Economics from the University of Toronto. Alexa also serves as a Director of Central City Foundation, a $36 million foundation providing funding and support for programs, capital projects and social purpose real estate for neighbours in need in Vancouver's inner city. Carl is an Investment Manager with Deetken Impact focused on analyzing and working with micro-enterprises, social entrepreneurs, and renewable energy developers in Latin America and the Caribbean. He shepards investment opportunities from initial screening through detailed due diligence to presentation and investment committee approval. This includes work for the Deetken Impact Fund (DIF), Caribbean Basin Sustainable Energy Fund (CABEF), and Honduras Renewable Energy Financing Facility (HREFF). In addition, he leads advisory and research projects aimed at addressing challenges faced by investees or their clients. Previously, Carl worked as a management consultant with a focus on financial analysis for large scale energy and infrastructure projects, and as a researcher at the Bank of Canada focused on household and business credit. Carl completed an Honours BA in Economics at the University of British Columbia. He also holds an MSc in Economics & Development from the University of Oxford, where he earned distinctions in quantitative and development economics. Carl works in both English and Spanish. Magali has extensive market intelligence and business development experience having worked at the Central Bank of Mexico, the Canadian Institute for Market Intelligence - a business development arm of the National Research Council (NRC) of Canada, and the IESE e-Business Centre - a partnership between PWC and IESE Business School in Barcelona. After almost a decade of being an entrepreneur co-leading national marketing and branding campaigns for businesses in the hospitality and early childhood education sectors, Magali decided to use her marketing, business development and international experience to help generate social and environmental impact in Canada, Latin America, and the Caribbean. As Director of Communication & Development, she is responsible for leading Deetken Impact’s communications, marketing and branding strategy. She is also involved in the due diligence process for project selection with an emphasis in Mexico. Magali holds a Bachelor’s degree in Economics from Mexico’s ITAM and a Master's degree in Economics from the University of British Columbia, and has experience working in Mexico, Spain and Canada.